Looking to boost the success of your supply chain in 2019? Make sure you know what lies ahead for small- and mid-sized businesses! EazyStock compiled the top trends to watch out for in 2019 and regulations that might affect your business. 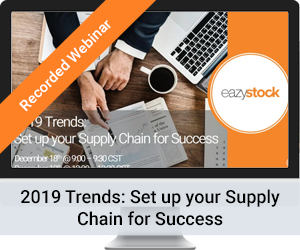 View our webinar to discover what the new year will bring and how you can keep your supply chain and company competitive! Fill in the form to watch the webinar recording now.